Learn more about using this important tool for Java devs. Apache Maven, or more commonly known as just "Maven," is an important tool for Java programmers. It allows you to build your project, manage dependencies, generate documentation, and a lot more. I can vouch for Maven's usefulness because I have come from the pre-Maven world of Software development, where you need to manage all the JAR files required by your project. It may seem easy to you that just download the JAR file, but it's not so easy in practice. For example, you added a new library in your project — say the Spring Framework, which also needs log4j, but you thought log4j is already there, so you didn't do anything, only to realize that your application is not starting anymore and throwing long and convoluted errors. This can happen because of version mismatch, like Spring needed a higher version of log4j than available in your project. This is just a tiny example that shows how manually managing dependencies can create nightmares. Maven took away all those pain by not only automatically downloading those JAR files for you but also created a central place, known as a Maven repository, to store those JAR files for better management. Maven is not just a dependency management tool; it's, in fact, much more than that. The biggest advantage of using Maven is the following convention, which makes software development easy. 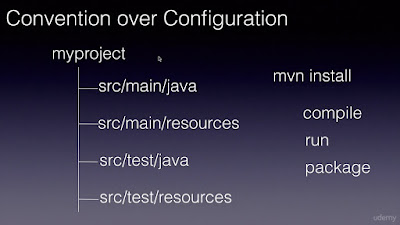 In a Maven project, you know where your source code is, where your test code is and where your resources are. You don't need to spend countless hours going through a massive ANT build file to figure out how exactly is your artifact is created. Because of these useful qualities, the Java ecosystem adopted Maven generously. Most of the open source project is a Maven project which makes it easy for developers to understand them and contribute better. Even though Gradle is making inroads, 70 percent of the market is still using Maven, and that's a big enough reason to learn Maven. If you also think so, here are some of the best courses to learn Apache Maven online by yourself. In this course, you will learn about the Maven Build Lifecycles, how to use Maven to build and package Java projects, and understand how to use Maven with popular alternative JVM languages, including Groovy, Kotlin, and Scala. I am a big fan of John Thompson; having attended his Spring 5 course, Spring 5: Beginner to Guru, I have hooked to his teaching style and information delivery. When I found that John has a Maven course, I immediately bought it even though I know Maven and worked on several Maven project, including multi-module Maven project. Though I wasn't disappointed, the course helped me fill some of the gaps I had in my learning. It's particularly useful if you are coming with no Maven experience, as the information density is perfect from a beginner's perspective. You will also learn how to configure Maven to run your unit and integration tests written in JUnit 3, JUnit 4, JUnit 5, TestNG, and the Spock framework to generate source code from XML and JSON Schemas and leverage annotation processing at compile time for Project Lombok and Mapstruct. The course also covers the Apache Maven plugin system and teaches you how plugins are used in the build lifecycle. Finally, you will also learn how to build a Spring Boot application with Apache Maven, learn about the Spring Boot Maven plugin, deploy project artifacts to Maven repositories, and how to develop multi-module Maven projects. In short, a perfect course to master Maven is ideal for both intermediate and senior Java developers. I personally like crash courses because I am always in a hurry and don't really have too much time to invest. A crash course will teach you just 20 percent of things but those are the ones you will need most and use 80 percent of the time. This course is not an exception; instructor Bharath Thippireddy has done a fabulous job explaing core concepts of Maven in just less than three hours. In this course, you will not only learn all the core concepts of Maven but also work for hands-on to create a multi-module Maven Java web application project. The course is also good for beginners as it teaches Maven from scratch right from downloading and installing Maven, using in the command line, and creating a Maven web application in Eclipse using the m2eclipse plugin. If you are in a hurry and want to learn Maven, this is the course you should join. 101 kinds of courses are the exact opposite of a crash course, and they cover the topic in depth, and if you want to learn Maven in depth, this is the perfect course to start with. In this hands-on course, you will learn how to use Maven with other tools like with IDEs Eclipse or IntelliJ IDEA and Version Control tools like Git or GitHub. As I told you, I know Maven and have been using both Maven and Eclipse for years, but having gone through this course, I learned a couple of things about Maven that I didn't know before. I feel that now I have a much better understanding of Maven's overall lifecycle/phase/goal architecture and how to use Maven with Eclipse WTP for creating Maven based web applications. This is an excellent course to learn Maven with a good instructor, clear explanation of the concepts, and just the right kind of information depth that an intermediate Java developer needs to learn Maven. The course starts by teaching you how to build a project, and then, it jumps into dependency management. From there, Kevin teaches you about the Maven lifecycle, Maven commands, and plugins, including plugin parameters and custom plugins. The course also covers goals and plugins, including how to install and deploy a plugin. Finally, you will learn about archetypes, additional features, and the .M2E Eclipse plugin. In this course, Bryan has covered all of the basic concepts of Maven that you need to know like directory structure, dependencies, plugins, repositories, IDE integrations, and all the basic commands of Maven. Bryan Hansen is another instructor that I personally admire and follow. Having attended his Spring courses like Spring Fundamentals and What's New in Spring 5, I love how he keeps important concepts simple, and this course is no exception. However, one thing to keep in mind is that you need a Pluarlsight membership to access this course, which costs around $29 per month or around $299 per annum. This might look bit expensive at first, but it's worth the money because you would get access to more than 5000+ online courses. A small bit of investment in learning can pay a rich dividend; hence, I advise all programmers to join Pluralsight. But even if you don't have a membership, you can still access this course for free by taking advantage of their 10-day FREE pass, which allows 200 minutes of watch time, which is enough time to finish this course. 1. Maven has almost 70 percent of the market, 20 percent Gradle, and 10 percent ANT. 2. Maven is a build tool like, make or ANT, which takes your source code and generates a JAR file, distributable library. It can also run tests and generate Javadoc when you build your software. It also helps in build-automation. It allows each developer to kick-off the same build to generate the same deployable. 4. Maven command line tool — you can use Maven from the command prompt, but you can also use Maven from IDE also like Eclipse or IntelliJ IDEA. 5. Maven as a project management tool — It helps to tell you about what is being used in your project. It can also hold an artifact in a repository like Nexus. 6. Maven provides a standardized approach to building software, a consistent approach like source and test directory, build artifacts as it promotes "Convention over Configuration." That's all about some of the best courses to learn Apache Maven. As I have said, Maven is the most popular build tool and you will find it on most of the places. It offers a really cool advantage like dependency management, build-automation and it's also well integrated with other common tools like IDEs ( Eclipse, NetBeans or IntelliJIDEA) and version control tools like Git and Github. Thanks a lot for reading this article so far. If you like these Maven courses, then please share them with your friends and colleagues. If you have any questions or feedback, then please drop a note below. Lastly, if you are looking for some free stuff to start your Maven journey, then you can also check out this list of free Maven courses for Java programmers.